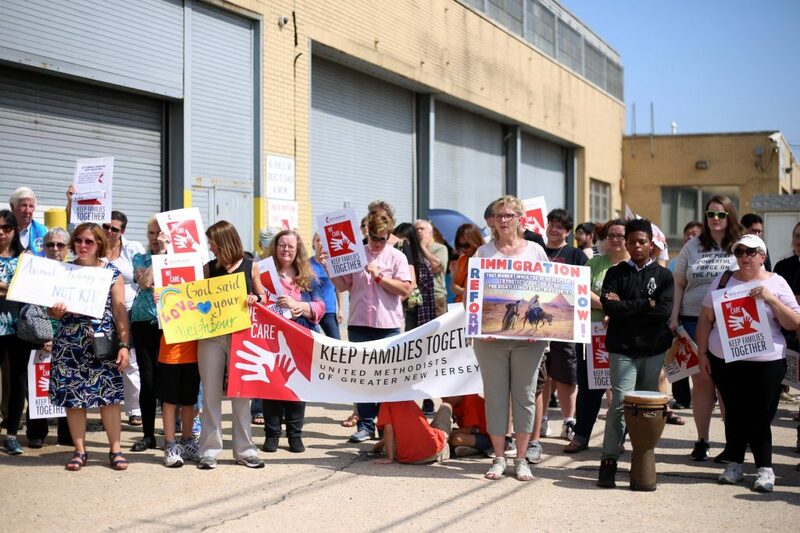 ELIZABETH – Church leaders and dozens of community members from across Greater New Jersey gathered on Saturday, July 28 outside the U.S. Immigration and Customs Enforcement Contract Detention Facility in Elizabeth to protest and pray for those being held after trying to seek asylum in the U.S. The crowd heard words of encouragement and calls to action by community activists and faith leaders, including Bishop John Schol. The rally was sponsored by the GNJ Board of Church and Society Immigration Task Force, Hispanic Committee, United Methodist Women (UMW) and Black Methodists for Church Renewal (BMCR). The crowd of close to 100 protesters held signs and sang along with a choir from Asbury Park. They held hands and bowed heads in prayer; the silence punctured only by amen’s as they stood in the scorching heat of the day. Two security guards stood at the gate to allow rare visitors into the detention center. When asked how he felt about the rally, one guard said he was just doing his job and it was up to the higher-ups to answer to the public. Across the street, a female guard stood by herself with hands clasped, almost moved to tears by the prayers and song. Bishop John Schol inspired those gathered with a reflection of how Christians are to live our lives. Harriett Olson, General Secretary of United Methodist Women, travelled from Washington, D.C. to take part in the vigil. She encouraged the group to act, attend rallies, and contact their government representatives. Two women in the crowd seemed particularly invigorated by Olson’s words. Julia Aberget and Joanne Booth from Pennington are not new to the idea of protesting. The crowd heard several speakers including Bishop William Stokes of the Episcopal Church of New Jersey, bowed in prayer as GNJ clergy lifted up prayers, and joined together in song as Drew University’s Mark Miller led music along with a choir from Asbury Park’s Spirit of Truth Vision Outreach Church. One of the Prayer Rally’s most powerful moments occurred when one of the speakers asked the crowd to touch the wall of the detention center during a prayer. More than one hundred pairs of hands touched the walls sensing those who were on the other side and felt God’s Holy Spirit flowing amongst their neighbors who gathered with them for justice and for God. Burgos encouraged attendees to continue advocating for children, young people and immigrant families and to develop awareness programs to educate congregations and communities about the importance of advocating for immigrants. The speakers denounced the mistreatment of immigrants being held in facilities across the U.S. including the facility in Elizabeth. The crowd urged federal representatives to take steps toward the adoption of a fair and just comprehensive immigration policy that respects human beings who are escaping from torture, potential death, and inhuman conditions in their home nations.